For the first time, Lebanon-based Al-Mayadeen TV released new dramatic footage showing Israeli forces using a weaponized unmanned aerial vehicle (UAV) against a Hamas rally in the Gaza Strip, according to the Times of Israel. Israeli Border Police Deputy Commissioner Yaakov Shabtai, the government official behind the deployment of the weaponized unmanned aerial vehicle (UAV), told Hadashot TV news that the tear gas drone provides security forces with an extended range to hurl chemical weapons at protestors. “Beyond the fact that this equipment neutralizes any danger to the troops, it enables reaching places that until now we could not get to,” Shabtai told Hadashot TV news. The weaponized unmanned aerial vehicle (UAV) “can carry up to six canisters at a time, and drop them individually, as clusters, or all at the same time,” said the Times of Israel. The Israeli-based online newspaper did not provide the manufacture’s name of the UAV, but it is rumored that ISPRA Ltd in Herzelya, Israel, is the developer of the drone, dubbed Cyclone Riot Control Drone System. ISPRA’s Anti Riot Drone provides law enforcement units with an extremely large range mode of work, enabling them to react against rioters and demonstrators at an early stage of the event, at a distance while avoiding direct confrontation with rioters. This unique and innovative solution, developed by Ispra, allows law enforcement units to react when a barrier or obstacle is separating between the parties. With several drones, a continuous presence over the rioters can be maintained, dispersing non-lethal ammunition and providing commanders with real-time video image of the situation on the ground. 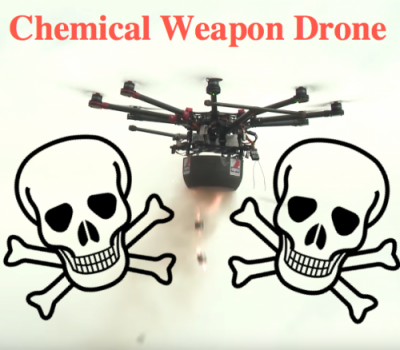 Developers of ISPRA present a short informational video of how the chemical weapon drone works. The Times of Israel adds that Israeli officials are preparing for months of border protests, which will lead to a large demonstration on May 15. According to an Israeli TV report, Hamas, a Palestinian Sunni-Islamic fundamentalist organization, has budgeted $10 million to fund the upcoming protests. “We want to frighten the Israelis with the images of massive crowds of people who peaceably gather and sit close to the border,” Hamas spokesman Ahmed Abu Retaima recently told Bloomberg. Meanwhile, Sputnik news agency states that Israel did not sign the Chemical Weapons Convention of 1993, which enables the Israel Defense Forces (IDF) to legally deploy chemical weapons such as tear gas against civilians. Israel’s decision blend high-tech drone technology coupled with chemical weapons against civilians paints a turbulent outlook for spring uprisings in the region. Nevertheless, please do not mention this technology to the countless militarized police forces across the United States; otherwise, this dystopian technology is coming to a town near you. Featured image is from Zero Hedge.